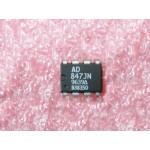 Purchase online AD811 Video Op-Amp in India at low cost from DNA Technology, Nashik. AD811 is a wideband current feedback operational amplifier, the AD811 is optimized for broadcast-quality video systems. The −3 dB bandwidth of 120 MHz at a gain of +2 and the differential gain and phase of 0.01% and 0.01° (RL = 150 Ω) make the AD811 an excellent choice for all video systems. The AD811 is designed to meet a stringent 0.1 dB gain flatness specification to a bandwidth of 35 MHz (G = +2) in addition to low differential gain and phase errors. This performance is achieved whether driving one or two back-terminated 75 Ω cables, with a low power supply current of 16.5 mA. 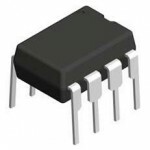 Furthermore, the AD811 is specified over a power supply range of ±4.5 V to ±18 V.
The AD811 is also excellent for pulsed applications where transient response is critical. It can achieve a maximum slew rate of greater than 2500 V/μs with a settling time of less than 25 ns to 0.1% on a 2 V step and 65 ns to 0.01% on a 10 V step.